Based on an earlier report of raised titres of herpes simplex viral antibodies in Obsessive-compulsive disorder subjects, and a propensity for this virus to affect limbic structures, a study was conducted to look for the presence of obsessive-compulsive symptoms in surviving patients of herpes simplex encephalities. Two out of five neurologically stable patients studied had elevated scores on Leyton's Obsessional Inventory and Yale Brown Obsessive compulsive scale, but none fulfilled criteria for obsessive compulsive disorder. Furthermore tow case reports of patients with herpes simplex encephalitis presenting with obsessive compulsive disorder are reported. The possible models to explain this association between Herpes simplex encephalitis and Obsessive compulsive disorder are shared neurobiological substrates or shared neuropsychological deficits. Congenital myasthenic syndrome (CMS) is a rare disorder of the neuromuscular junction. We report here 19 patients, 7 sporadic and 12 from 6 families, with the age at diagnosis ranging between 1.5 years to 26 years (Mean-15yrs). There were 7 males and 12 females. All patients had ophthalmoplegia. Bulbar and limb muscle weakness with preserved reflexes was observed in 12 patients, All except tow presented with fluctuating opthalmoplegia, one each for cosmetic appearance and one for fatigue, Three patients had prognathism. All patients had normal ECG and serum creatine kinase levels. Acetylcholine receptor (AchR) antibodies were absent in all. Electrophysiological workup showed a decremental response to repetitive nerve stimulation at low rates (LRS) in all, Electrophysiological workup showed a decremental response to repetitive response to single stimulus. Needle EMG was normal. All patients had good response to parenteral neostigmine which was confirmed electrophysiologically. Second degree consanguinity was observed in 4 sporadic and 4 familial cases. Spontaneous remission was reported in none. This group of cases conforming to the class of CMS are noteworthy, because of high number, paucity of dysmorphic features, relatively benign course and response to anti cholinesterase drugs, Recognition of this entity from autoimmune myasthenia gravis by seronegativity and onset at birth or childhood is important as immunotherapy and thymectomy ineffective in CMS. This retrospective study examined the incidence and factors influencing the occurrence of nonsocomial pneumonia (NP) in a neuromedical intensive care unit (NICU). Of the 57 patients admitted to the NICU over one year, 26% developed nosocomial pneumonia. It was observed that the infected patients were significantly older than the noninfected (43+15 vs 22+18 years; p<0.001), had a longer NICU stay (33+31 vs 18+18 days: p=0.05) and needed longer duration of mechanical ventilation (20+25 vs 9 + 12 days: P<0.05). Patients with neuromuscular diseases had a trend towards higher incidence of NP than those with encephalopathy and therapeutic interventions such as plasmapheresis, blood transfusion and inotropic therapy did not influence the incidence of nosocomial pneumonia. The NICU mortality was not significantly influenced by nosocomial pneumonia. Pseudomonas aerugenosa was the predominant organism responsible for pneumonia. Nine percent of the tracheobronchial isolates were resistant to the routinely-tested antibiotics. In conclusion, nosocornial pneumonia is a common complication in a NICU and while it increases the duration of NICU stay, mortality appears to be uninfluenced. Apart from its usual origin form the first part of the maxillary artery the middle meningeal artery (MMA) may arise from a number of other sources, viz., third part of the maxillary artery, stapedial, ophthalmic, cavernous portion of the internal carotid and even the basilar artery, Six cases of MMA Originating from the orbit as observed in dry skulls and dissecting room cadavers are described here. Foramen spinosum in all these cases were either rudimentary or absent. The embryological basis and surgical importance of this anomaly is discussed. Fragile X Syndrome is a common cause of mental retardation and the first disorder detected to have the novel trinucleotide repeat mutation. In this study, a detailed evaluation of physical, cognitive, and behavioral phenotype was carried out. The sample consisted of 16 subjects (13 male and 3 female) who were cytogenetically proven to have fragile X syndrome. A battery of standard tests was used to elicit the different facts of the phenotype. Results indicate that by and large, the pattern and prevalence of phenotypic characteristics are similar to what is reported in the literature. However, two unusual findings: one subject having severe microcephaly, and two sibs with rapidly progressive neurological disorder and described. Possibility of other etiologic factors in addition to fragile X syndrome could not be ruled out in these three subjects. The clinical features of Neurocysticercosis (NCC) are protean and include major cause of young and adult onset epilepsy in tropical countries. Neurocysticercosis is endemic in Latin America, sub-Saharan Africa, India, China, Eastern Europe and is encountered sporadically practically all over the world. Recent study we describe 206 cases of NCC identified over a 5 year period at the All India Institute of Medical Sciences, New Delhi. 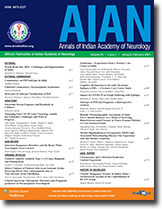 Materials and method: Medical records of 206 cases of Neurocysticercosis were reviewed and data obtained which included demographic, clinical features and neuro imaging. Result: Seziures were the commonest presentation in 92.2% of cases of which60% had simple partial seizures, headache, papillodema, and coma were other presenting features. Commonest CT finding was ring or disc lesion was found in 17.5% . Hydrocephalus and ventricular cyst were present in 5.8 and2% of cases respectively and 4.8% had ocular cysticercus. Conclusion: Our study reaffirms that the clinical presentation of NCC is protean and perplexing at times. Seizures are the commonest manifestation of NCC, We recommend that all cases of young and adult onset epilepsy should be investigated for Neurocysticercosis.